Batted .252 with 9 HR and 28 RBI in 98 games with Milwaukee ... Made 84 starts, all at catcher ... Batted .337 (31-for-92) with 3 HR and 12 RBI over his last 33 games ... The team had a 4.00 ERA when he caught (743ip, 330er) and went 52-32 when he started ... Threw out 18 of 47 runners attempting to steal (38.3%) ... Was a Gold Glove finalist for the first time along with the Cardinals' Yadier Molina (winner) and Giants' Buster Posey ... Was on the 10-day disabled list from 4/16-4/23, retroactive to 4/13, with a right calf strain ... Was also on the 10-day disabled list from 7/8-7/19, retroactive to 7/7, with a left biceps strain ... Went 3-for-7 (.429) in 5 games during the postseason ... Played for Lara in the Venezuelan Winter League ... Signed a 1-year contract with a club option for 2020 on 1/11/19, avoiding arbitration. Made his first career Opening Day roster...Batted .279 with 9 HR and 43 RBI in 107 games during his first full Major League season... Made 83 starts, all at catcher.....the Brewers went 45-38 in his starts...The team posted a 3.80 ERA in games he caught (760.1ip, 321er)...Threw out 19 of 57 runners attempting to steal (33.3%)... His 6 pickoffs tied the Cubs' Willson Contreras for the Major League lead among catchers... From 4/6-4/24 had a career-high 10-game hitting streak, batting .472 (17-for-36, 1hr, 5rbi)...Joined Ben Oglivie (1978 and 1982) as the only players in franchise history to homer on both Mother's Day (3-run HR in 8th inning vs. NYM) and Father's Day (solo HR in 6th inning vs. SD) in the same season.....both of those homers were game winners... Missed the last 9 games of the season with a sprained left thumb.....suffered the injury on a play at the plate involving Anthony Rizzo on 9/21 vs. Chicago-NL... Was named to the 2017 Topps All-Star Rookie Team...Played for Lara in the Venezuelan Winter League. Contract was selected by Milwaukee on 8/1 from Triple-A Colorado Springs, where he batted .329 with 5 HR and 43 RBI in 63 games.....took the roster spot vacated by Jonathan Lucroy, who was traded to Texas...Was a Pacific Coast League All-Star... Batted .254 with 2 HR and 12 RBI in 33 games with Milwaukee...Made 17 starts (16g at C, 1g at DH)...The Brewers went 6-10 in his starts behind the plate...The team posted a 4.02 ERA in games he caught (141ip, 63er)...Threw out 5 of 18 runners attempting to steal (27.8%)...Belted his first Major League home run on 8/12 vs. Cincinnati with a pinch-hit, 3-run shot off Keyvius Sampson.....was his second straight 3-RBI performance (also 8/11 vs. Atlanta)...Played for Lara in the Venezuelan Winter League (31g, .316, 2hr, 18rbi). Batted .305 with 7 HR and 39 RBI in 77 games at Triple-A Toledo...Was traded by Detroit to Milwaukee on 12/10 to complete the 11/18 deal in which the Brewers acquired RHP Francisco Rodríguez. Signed as a free agent with Seattle on 1/17...Batted .267 with 2 HR and 13 RBI in 21 games between Triple-A Tacoma (4g) and Double-A Jackson (17g) before he was traded to Detroit in exchange for cash on 6/11...Finished the season at Triple-A Toledo, batting .268 with 3 HR and 16 RBI in 38 games...Played for Margarita in the Venezuelan Winter League (44g, .270, 5hr, 24rbi). 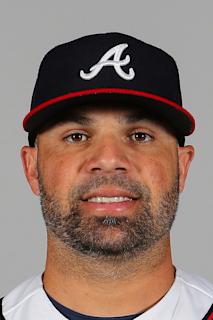 Split the season between AA Northwest Arkansas and AAA Omaha, appearing in 86 games…began the season rehabbing from an injury to the lateral meniscus in his right knee and was not on an active roster until June 30…hit .333 (32x96) in 37 games with Bravos de Margarita in the Venezuelan Winter League. Manuel was on the Royals roster after his recall from Northwest Arkansas (AA) on September 1, but appeared in just one game at the big league level...He underwent surgery to repair a meniscus tear in his right knee during Spring Training...missed the first three months of 2012 before returning on a rehab assignment with Surprise on June 25. Manuel was recalled to the Majors on July 31 and made his Major League debut on August 3 vs. Baltimore ... recorded his first big league hit with a double that night. ... Optioned to Omaha on August 11 and then recalled following the minor league season on September 21. ... Batted .368 (7-for-19) with 8 RBI in 6 games during the PCL playoffs as Omaha won the league title. Spent a majority of the campaign, his first full season in the Royals organization, at NW Arkansas (AA) serving as the primary catcher for the Texas League Champions...also played 17 games at Omaha (AAA)...Enjoyed hitting at home, compiling a .311 (42-for-135) average with 5 of his 7 home runs at Arvest Park...Threw out 33 of 74 attempted basestealers (44.6%) for NW Arkansas and 35 of 83 (42.2%) overall in 2010. Got off to a blazing start at the plate for Frisco (AA) in the Rangers organization, hitting .481 (25-for-52) with 3 home runs in April and was named the starting catcher for the South Division in the Texas League All-Star Game...After being acquired by the Royals, was assigned to NW Arkansas but did not appear due to a groin injury...Played 13 games for Tiburones de La Guaira in the Venezuelan Winter Leagues, compiling a .407 on-base pct. Combined for a .267 (81-303) average with 3 homers and 33 RBI in 84 games at Bakersfield (A) and Frisco (AA)...established career highs in most offensive categories...started 61 games behind the plate for the Blaze with a .994 (3 E/502 TC) fielding percentage...hit just .213 (13-61) in 18 games in April before producing a .319 (23-72) mark over 19 contests in May...was 9-for-50 (.180)in 14 June games before hitting .350 (14-40) with 2 homers in his 10 contests in July...hit safely in final 7 games with Bakersfield at .379 (11-29)...was promoted to Frisco 1st time on June 22 but appeared in just one game before returning to Bakersfield on June 28...returned to RoughRiders on July 30 and started 22 games over the season's final month...did not commit an error in 164 total chances at Frisco...hit .333 (12-36) in final 10 regular season games...was 10-for-25 (.400) vs. lefthanders with the RoughRiders...batted .091 (1-11) in 3 playoff starts for the RoughRiders. Split the catching duties at Clinton (A)...batted just .198 in 28 games over April and May before producing a .348 average in June...hit 1st professional home run on June 12 vs. Kane County...hit .288 in 46 home games but .169 in 40 road contests...threw out 37.9% (44-116) of would-be base stealers, 5th best among Midwest League catchers. Appeared in just 14 games in 2006 after missing a majority of the season recovering from right elbowsurgery. Spent his first professional season in 2005 with the Arizona Rangers and was named by Baseball America as the 12th-best prospect in the entire Arizona League. July 20, 2018 Milwaukee Brewers activated C Manny Pina from the 10-day injured list. July 18, 2018 Milwaukee Brewers sent C Manny Pina on a rehab assignment to Wisconsin Timber Rattlers. July 8, 2018 Milwaukee Brewers placed C Manny Pina on the 10-day disabled list retroactive to July 7, 2018. Left biceps strain. April 24, 2018 Milwaukee Brewers activated C Manny Pina from the 10-day disabled list. April 16, 2018 Milwaukee Brewers placed C Manny Pina on the 10-day disabled list retroactive to April 13, 2018. Right calf strain. November 27, 2017 C Manny Pina assigned to Cardenales de Lara. November 5, 2016 C Manny Pina assigned to Cardenales de Lara. August 1, 2016 Milwaukee Brewers selected the contract of C Manny Pina from Colorado Springs Sky Sox. June 30, 2016 Colorado Springs Sky Sox activated C Manny Pina from the 7-day disabled list. June 15, 2016 Colorado Springs Sky Sox placed C Manny Pina on the 7-day disabled list. April 4, 2016 C Manny Pina assigned to Colorado Springs Sky Sox. September 29, 2015 C Manny Pina assigned to Bravos de Margarita. April 10, 2015 C Manny Pina assigned to Toledo Mud Hens. January 20, 2015 Detroit Tigers invited non-roster C Manny Pina to spring training. June 11, 2014 Seattle Mariners traded C Manny Pina to Detroit Tigers for Player To Be Named Later. June 11, 2014 C Manny Pina assigned to Toledo Mud Hens. April 29, 2014 C Manny Pina assigned to Jackson Generals from Tacoma Rainiers. April 15, 2014 C Manuel Pina assigned to Tacoma Rainiers. January 17, 2014 Seattle Mariners signed free agent C Manuel Pina to a minor league contract and invited him to spring training. November 4, 2013 C Manuel Pina elected free agency. October 10, 2013 C Manny Pina assigned to Bravos de Margarita. July 24, 2013 C Manuel Pina assigned to Omaha Storm Chasers from Northwest Arkansas Naturals. July 10, 2013 Manuel Pina assigned to Northwest Arkansas Naturals from Omaha Storm Chasers. June 30, 2013 Manuel Pina assigned to Omaha Storm Chasers from Northwest Arkansas Naturals. March 29, 2013 Manuel Pina assigned to Northwest Arkansas Naturals from Omaha Storm Chasers. November 7, 2012 Kansas City Royals invited non-roster C Manuel Pina to spring training. November 2, 2012 Kansas City Royals sent Manuel Pina outright to Omaha Storm Chasers. October 11, 2012 C Manuel Pina assigned to Bravos de Margarita. September 1, 2012 Kansas City Royals recalled Manuel Pina from Northwest Arkansas Naturals. July 14, 2012 Kansas City Royals optioned Manuel Pina to Northwest Arkansas Naturals. July 5, 2012 AZL Royals sent C Manuel Pina on a rehab assignment to Northwest Arkansas Naturals. June 25, 2012 Manuel Pina assigned to AZL Royals. March 20, 2012 Manuel Pina roster status changed by Kansas City Royals. September 21, 2011 Kansas City Royals recalled Manuel Pina from Omaha Storm Chasers. August 26, 2011 Manuel Pina roster status changed by Omaha Storm Chasers. August 17, 2011 Omaha Storm Chasers placed C Manuel Pina on the 7-day disabled list. August 14, 2011 Omaha Storm Chasers activated C Manuel Pina. August 11, 2011 Kansas City Royals optioned C Manuel Pina to Omaha Storm Chasers. July 31, 2011 Kansas City Royals recalled Manuel Pina from Northwest Arkansas Naturals. July 27, 2011 Manuel Pina assigned to Northwest Arkansas Naturals from Omaha Storm Chasers. June 23, 2011 Manuel Pina roster status changed by Omaha Storm Chasers. June 16, 2011 Omaha Storm Chasers placed C Manuel Pina on the 7-day disabled list. March 21, 2011 Kansas City Royals optioned C Manuel Pina to Omaha Storm Chasers. October 13, 2010 Manuel Pina roster status changed by Kansas City Royals. October 11, 2010 C Manuel Pina assigned to Bravos de Margarita. September 18, 2010 Manuel Pina roster status changed by Northwest Arkansas Naturals. July 31, 2010 C Manuel Pina assigned to Northwest Arkansas Naturals from Omaha Royals. July 4, 2010 Manuel Pina assigned to Omaha Royals from Northwest Arkansas Naturals. June 21, 2010 Manuel Pina roster status changed by Northwest Arkansas Naturals. March 16, 2010 Kansas City Royals optioned C Manuel Pina to Northwest Arkansas Naturals. March 16, 2010 Kansas City Royals reassigned C Manuel Pina to the minor leagues. November 20, 2009 Kansas City Royals selected the contract of C Manuel Pina from Northwest Arkansas Naturals. October 8, 2009 C Manuel Pina assigned to Tiburones de La Guaira. September 21, 2009 Manuel Pina roster status changed by Northwest Arkansas Naturals. September 4, 2009 Texas Rangers traded C Manuel Pina to Kansas City Royals. September 4, 2009 C Manuel Pina assigned to Northwest Arkansas Naturals from Kansas City Royals. August 19, 2009 Manuel Pina roster status changed by Frisco RoughRiders.